Mercedes-Benz is a global automobile manufacturer and a division of the German company Daimler AG. The brand is not only known for its luxury vehicles but also its high performance and long lasting buses and trucks. 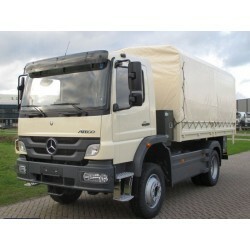 The Mercedes-Benz Atego is a light general purpose rigid truck introduced by Mercedes-Benz in 1997. Available in weights of 7,5 to 16 metric tonnes and is powered by a straight 4- or 6-cylinder engine. From the 2005 facelift Atego models over 18 tonnes were renamed Mercedes-Benz Axor. The truck won the International Truck of the Year award in 1999 and 2011.